I’ve had a draft of this article sitting here for over a year. For some reason I just couldn’t. It didn’t seem right, putting pen to paper in preparation for what would happen at 10:10pm on November 30th, 2018. I’m more emotional than I thought I’d be, having walked through the door to the news after running a quick evening errand for my husband. It had been a rough day. Actually that’s not true. The day was fine, having even enjoyed some great news on the health front, until I started scrolling through Facebook. One of my friends had posted a video of a song that breaks even the hardest of hearts, “The Christmas Shoes”. It was then I recalled what day it was. An anniversary no one celebrates. Missing the one who brought me into this world so desperately, and fighting back tears unsuccessfully, I left the house. I returned home to the news that I would forever have a day of grieving in common with the likes of George, Jeb, Neil, Marvin, Doro, and countless grandchildren. President George Herbert Walker Bush was gone. So many remember and mourn the patriot who served this country he loved for over 70 years. Some remember the times when “41’s” compassionate heart couldn’t be contained – like the time he shaved his head in solidarity with his Secret Service agents, one whose son was battling leukemia. Leukemia – the same disease that took Bush’s young daughter at the age of 3. Yet others turn to letters, notes written by the man himself. President George Herbert Walker Bush was an avid writer from an era gone by. 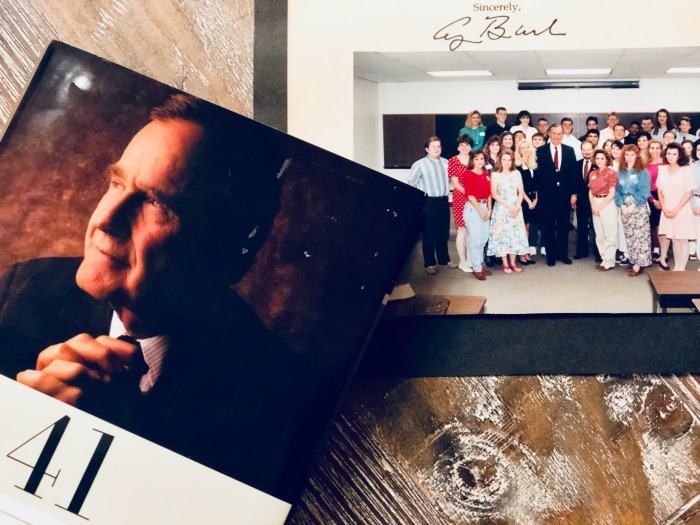 I recall his son, President George W. Bush, remarking on the thousands of people who would be able to open a drawer and pull out a letter from his father. Tonight I stare at a letter within arms reach. I admire the formal stationery with a name we all recognize centered neatly at the top, all capital letters, in navy blue font. I spy the familiar address in Houston, Texas on Memorial Drive. And then I see it…”Dear Debra”. I’m reminded of a day 25 years ago when a young woman with huge aspirations had the chance of a lifetime. You see, though the last few years as a writer have afforded me opportunities to interview many celebrities, my very first interview – President George H.W. Bush. It wasn’t an interview in the classical sense. I wasn’t yet a journalist, never even dreaming one day I would be. My eyes were set on a far different career path. Yet there I was, able to ask the man who had served as Commander in Chief, Director of the CIA, and Ambassador to the United Nations, whatever I wanted. Well, maybe not whatever I wanted. I did have to get my question approved from my professor. I was a mere college student who was lucky enough to be attending a college very close to “41’s” heart, one where he would put roots down, have an apartment on campus, build a library, and move his daughter’s remains to. More than interested in politics at the time, I found myself enrolled in a Presidential Studies class at a time when the President was just months into transitioning from public life. You can imagine the phone call to my parents and grandparents when I could announce who would be visiting our classroom. With butterflies in my stomach, and wearing an outfit not really fitting the occasion, I headed to campus where I was met with a team charged with protection on a scale you can’t fathom. The Secret Service was not to be messed with and protocol that day for class was anything but ordinary. Metal detectors were gone through and I made a beeline for my professor. I had a concern. We were minutes from the former President of the United States walking through the door and I wanted to change my question, the one which had been painstakingly approved of beforehand. I didn’t think my question was good enough. He quickly approved my new question and I took a seat directly in front of, but a few rows back, from where Bush would be sitting. Nerves. They were getting the better of me. Wearing a dark suit and playing to the crowd with his choice of tie, we were in the presence of a man who truly was interested in our studies. But we knew – there was a big difference between analyzing presidencies and questioning the one who lived it. That’s why he was there. Surprising to even me, I raised my hand to ask the first question, quickly and without hesitation. The next moments were spent in disbelief as I chatted with the former leader of the free world about the demise of the Soviet Union. I wish it had been the days of social media, where every word, every glance had been recorded. A transcript or audio tape in my drawer would be a prized possession today. Though I hung on every word in those moments, what I remember most is the precision with which he chose his words, the ability to make me feel like I was the only one in the room, and the actions of a gentleman that he always was. So tonight, having brushed away sleep, I tuck my prized letter away, one the President wrote to me just weeks after meeting. Along with it will rest the class photograph taken with him. I’ll share it with my daughter in the days to come, telling her of the time I met a great man whose service only continued when he walked away from The White House. One day soon we’ll head down to the place I once called home. We’ll stop by the Dixie Chicken, spy the corp of cadets as they march through campus, and humbly visit the gravesite where Bush will join two loves of his life – his wife and baby girl. Together again. Rest in peace President George Herbert Walker Bush. What a great memory to hang on to. To share with your daughter. You should have that letter and picture framed for your office wall. They have been in a frame, but I’ve never put it up. I really need to.